Open University of Bangladesh (BOU) SSC programme 2019-2020 Academic year admission Notice published. if you want to apply to The Education Class Programme. then read our post fully. because after reading the admission circular related post, you will know “how to apply for Open University” When published admission notice etc. When Students wish to apply on Open University for Secondary School Certificate (SSC) Academic programme. Then They will face some condition for Bou admission 2019. See below. Candidate must be JSC / JDC / Eighth grade passed from any government recognized equivalent examination. 2. Paper for bou ssc programme admission. 01 copy passport size Picture ( hard and scanned soft copy) within 300×300 pixels. Scanned soft copy of the signature (300X100 pixels). JSC / JDC / VIII passed certificate Copy from any Government. recognized equivalent examination. Birth Certificate / National Identity Card Copy. Fee Submission procces: BKash (charge 1.5%), Surecash (charge 1%) and DBBL (charge 15tk). Bangladesh Open university’s Open School managing SSC programme admission student can registration in online only through bou official website osaps.bou.edu.bd. After Complete online Form fillup student will get Temporarily user name and password by SMS. Then you Will Give Admission fees. Which refer above. When you will write your payment transaction id and Mobile number on Selected Place and press Submit Button. you will get “payment successfully” message by SMS/Email. Apply process complete. See Below Bou Admission 2019 real Notice as Bangla Language. 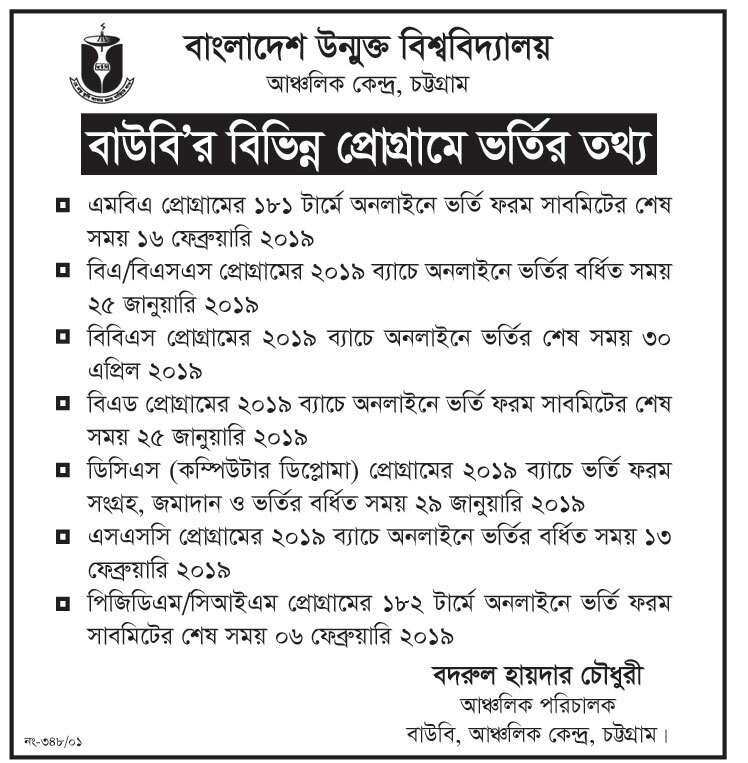 bangladesh unmukto university Admission Followers Can get all BOU Resional Center Vorti Circular from the post. Just See Bangladesh Open university resional Centers address. Bangladesh Open University ssc addmission in Chittagong. I hope you read our Bou admission information 2019-2020 related Article. Next time, any Update will upload here. until then visit our website. The follower can also Visit, Like & follow our Facebook page,Pinterest, Twitter, Linkedin, and Google+ for more details information.